Imagine this: in the late nighttime hours, the desperate cries of your child cause you to search for a therapy machine with only a flashlight. In the darkness, a car becomes your only power source to turn on the equipment that soothes your child’s shortness of breath. After being startled again, you return to your bed, knowing that the cycle will likely repeat, while your surroundings are filled with the smell of that fuel that allows others to sleep pleasantly as it burns and converts into carbon monoxide. A scene similar to this (or one even worse), takes place in thousands of homes. Puerto Rico has been smelling and breathing diesel ever since Hurricane María hit on September 20. In areas all around the island, the odor and noise of electric generators have become a permanent part of daily life. Eight weeks after the collapse of the island’s power grid, the government still has no clear policy to address the continuous operation of these electric plants, which are designed to be used just for emergencies. Licensed Electricians Association president Luis A. Sánchez estimates that of the more than 100,000 electric generators being used, the majority of them use gasoline and diesel. He confirmed that many residents lack access to electricians, causing them to install the generators without taking precautions and putting their safety and those of their neighbors at risk. After Hurricane Irma hit Florida’s Orange County in early September, three Puerto Ricans died from carbon monoxide emissions caused by a generator in their home. When Irma hit Puerto Rico days before it hit Florida, eight generator fires were reported and at least 30 people suffered from carbon monoxide inhalation caused by these machines. According to Alberto Cruz Albarrán, head of Puerto Rico’s Fire Department, 14 generator fires in homes and businesses have happened after Hurricane María, resulting in a total of 22 total generator fires for Irma and María combined. On October 20, Gabriel Mendoza Cortés, 27, died from carbon monoxide poisoning caused by a generator installed inside his Aguado home. And there have been at least 14 Puerto Rico Electric Power Authority (PREPA) workers injured from electrical lines during the power grid repair process. According to Jorge Bracero, PREPA’s auxiliary operator at the San Juan plant, there are a large amount of generators directly connected to the power grid. If someone didn’t have a transfer switch installed, the electricity produced from the generator would flow through the entire transmission line, endangering the lives of line workers who receive “the electric shock” when touching “live” lines. “This morning [Friday, November 9], during electrical work on a line in Vega Baja, one of the workers who had his hands on a line received an electric shock, and now that worker has second-degree burns: three fingers on one hand and one finger on another hand. The ignorance is that one person could have killed him, and now he is one of the 14 union electrical workers injured since María,” Bracero said. “The demand for these generators has been huge and at this moment, electrical workers are not offering any help with installations,” the Fire Department’s Cruz Albarrán said. He indicated that complaints about the incorrect use of generators received by his department are referred to the Board of Environmental Quality (JCA). Sources tell the Center for Investigative Journalism (CPI) that the Fire Department tries to address complaints related to the Noise Ordinance Law and the noises from residential and commercial generators. Cruz Albarrán said that all complaints are sent to the JCA. “We are taking note of the complaints, and yes, the fires caused by the use of these generators have increased. In Moca, there was one report of a person who received second- and third-degree burns,” the Fire Department official said. He also noted that that most of the fires happened because of the amount of hours these generators have stayed on, overlooking the fact that their usage should be limited. “These machines, for the most part, are not designed to operate daily. This atypical and extended emergency caused by Hurricanes María and Irma has led to time and usage challenges that have gone beyond manufacturing recommendations and have put the lives at risk of those people who have installed these generators without the required supervision,” CPI’s environmental lawyer Pedro Saadé said. CPI corroborated with several sources in different government agencies that there is still confusion about the JCA’s approved dispensation, and whether it is just a total deregulation for the use of these machines. 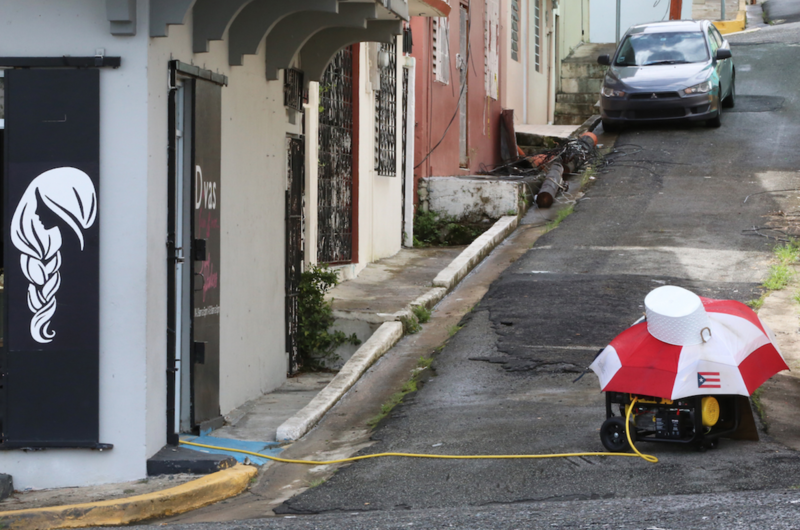 According to these sources, people have tried to file complaints to denounce the illegal operation of generators, but neither the Fire Department nor the Puerto Rico Police have paid much attention to these complaints, and in some cases, the officials did not take any action, arguing that there is a dispensation from the JCA. Other cases that the CPI could verify are still waiting for JCA inspectors of the JCA. According to attorney Verónica Rivera, there’s a perception in Puerto Rico —both with residents and at government agencies— that the JCA waiver has eliminated all regulations. As a result, during an emergency, people can set up a generator anywhere, without taking into account the gases dispersed, the noise level and the distance required from windows, homes and surrounding areas, which have caused health problems in communities. “I know of cases where people buy generators and place them inside their condominium apartments, like a case in Hato Rey on a very high floor, regardless of the risk it represents for the whole community and without the authorities doing anything. When the neighbors raise the issue with people, the answer is ‘call the police’,” Rivera said. According to CPI lawyer Saadé, the increase in the use of generators is “a time bomb” that the government has not managed properly, as the weeks go by and the restoration of the power grid is nowhere near completed. Rivera and Saadé agreed that the authorities should have foreseen the urgency of establishing a special protocol for the management of these generators during the time it takes to restore the power grid. Both lawyers thought that this was not a normal emergency, so the government should intervene to prevent unscrupulous people from affecting others by hiding behind a dispensation that does not exempt them. According to Rivera, establishing a special regulation and having informed officials could actually avoid the excuse that there is a dispensation that allows for the use of generators without restrictions. Tania Vázquez, president of the JCA, rejected the notion that the dispensation deregulated the use of generators. Vázquez insisted that the dispensation does not give people absolute freedom to install generators, and in fact only permits them to install a generator in a place that allows for ventilation and a dispersion of gases appropriate for the environment. In addition, the output of gases generated in the combustion process have to be directed into the atmosphere through a pipe, duct or chimney. It expressly prohibits the escaping gases to be directed towards other properties or near the windows of neighboring properties. Vázquez also indicated that generators should be 10 feet away from a home and 10 feet away from a neighbor’s home. They should also be in open spaces to maintain the adequate ventilation of fumes and to avoid possible carbon monoxide poisoning. Children should be prevented from approaching these machines due to the risk of burns. The generators must be located on flat surfaces and the authorized noise level at night cannot exceed 50 decibels at night. Even with the exemption, Vázquez insisted that the agencies are obliged to address complaints about the misuse of generators, because these agencies also have jurisdiction—such as PREPA, which is not exempt from intervening if a generator is poorly connected, or the Fire Department, if there is a potential fire hazard from a generator setup. She added that the Puerto Rico Police are obliged to intervene if there are problems between neighbors, and that the Department of Consumer Affairs (DACO) must also get involved if the conflict is in a condominium or complex where the Horizontal Property Law applies. “I cannot create a waiver that modifies, amends or violates a law or an active contract. People have to follow laws and regulations. This dispensation is not absolute, and it follows the full letter of the law,” she said. “About the dispensation of the power plants, I understand that people have misinterpreted it. It was taken out of context and that worries me. To make things worse, any excuse is good. People decided to interpret a very clear dispensation in their own ways to justify what is not justifiable. From now on, do not you hear me? Now I’m going to focus on the complaints and the fines,” said Vázquez, who is also the Secretary of the Department of Natural and Environmental Resources, during the fourth week after Hurricane María. Vázquez justified the need to establish a pre-emergency waiver due to the number of people whose lives depend on electrical appliances. However, she acknowledged the need to create more specific guidelines that would regulate the proper handling of these machines. “There is nothing written in stone here,” she said. “This dispensation has restrictions. The plants are not being used freely. Now, I cannot tell a person who has a respirator to ‘turn off the plant at 10pm’, because that person is going to die,” Vázquez said. Although she refused to share the total number of complaints filed for the misuse of generators after the dispensation was issued, Vázquez admitted that these complaints have increased since then and that the JCA staff cannot cope with the amount, which is why it has designated two areas of the regulatory agency to handle about 15 complaints a day. She also said that she asked for support from the Puerto Rico Police, the Fire Department and DACO, but did not answer if those agencies have responded to the JCA request. In addition to the JCA exemption, the federal Environmental Protection Agency (EPA) has also eased the application of standards to power plants or mobile generators being imported into Puerto Rico and the U.S Virgin Islands, as a response to the emergency after Hurricanes Irma and María. Since those two storms struck the Caribbean, EPA procedures for certain infractions of the Clean Air Act due to mobile power plants that have not been certified to comply with U.S. pollution control regulations do not apply to either Puerto Rico or the USVI. EPA spokesperson David Kluesner said the federal agency’s intention is to increase the number of generators available during the Hurricane María recovery, even if they do not meet air quality emission standards. “The EPA will not pursue enforcement actions for certain violations of the Clean Air Act for mobile power generators that have not been certified to comply with U.S. pollution control standards, and are imported for use in Puerto Rico and the U.S. Virgin Islands,” Kluesner said in written statements to the CPI. Under this temporary exemption, Kluesner explained, the import and sale of mobile power generators, even though they might not be legal for import and sale in Puerto Rico, will be allowed on the island if they meet air pollution emission standards that are similar to current EPA standards. The import and use of other mobile power generators that do not meet standards similar to current EPA standards are also permitted, but only if they are withdrawn from service and are not operated in Puerto Rico after March 31, 2018. Meanwhile, Carmen Guerrero, the director of the EPA for Puerto Rico and the Caribbean, confirmed that the air quality measurement system is not in operation, so it’s not certain what the environmental impact from these thousands of generators is, especially in regards to air quality. “We will be monitoring the situation. Having a number of generators indefinitely is not a sustainable solution for Puerto Rico,” Governor Ricardo Rosselló said weeks ago when he was approached by journalists about what actions his government would take to address environmental and health problems caused by heavy generator usage after María. No formal action to regulate the use of generators has been taken since then. However, there has already been an increase in health problems. The president of the College of Surgeons, Víctor Ramos, warned about the increase of cases related to respiratory diseases because the emissions from generators complicate the picture for people with conditions such as asthma, especially during this peak season of the respiratory syncytial virus and before the start of flu seasons. He explained that the proliferation of generators burning fossil fuels directly affects the environment for patients with respiratory conditions. “Cases have increased. The emergency rooms are full. In Fajardo, they are seeing about 500 patients a day. I am admitting many children with respiratory problems. To that, you add people with asthma or with any other respiratory problem who lack power and depend on inhalers, which in some cases no longer work,” Ramos said. The International Agency for Research on Cancer (IARC) of the World Health Organization (WHO)concluded in 2012 that gases emitted by the exhaust pipes of diesel engines, including electric generators, are carcinogenic. According to the WHO, the high concentration of fine particles that pollute the air is associated with a large number of cases of deaths due to heart disease and stroke, as well as respiratory diseases and cancer. Diesel engines without particle filters are a health hazard. The combustion of diesel in the engines generates particles so fine that the lungs are not able to retain them and they pass directly into the bloodstream. In short durations, they can cause headaches, nausea, pressure in the chest, shortness in breathing, coughing and irritation of the eyes, nose and throat. People suffering from respiratory diseases such as bronchitis, emphysema or asthma can experience adverse effects if they are exposed to long-term or constant emissions from diesel. For this reason, the U.S. Consumer Product Safety Commission recommends ventilation to minimize exhaust gases from generators. English version by Julio Ricardo Varela.